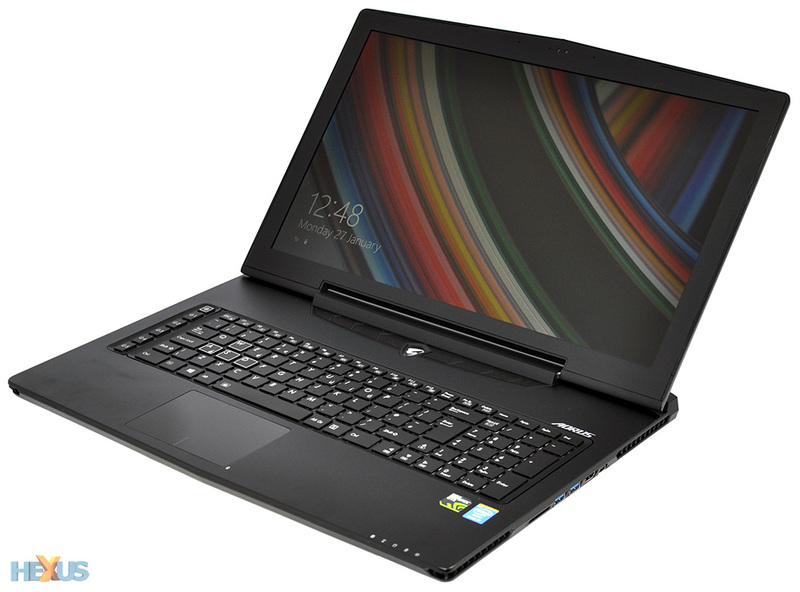 The challenge that laptop manufacturers face isn't necessarily in producing ludicrously-thin chassis. Instead, for the gaming market, it's how thin can you go while retaining as much performance potential as possible? 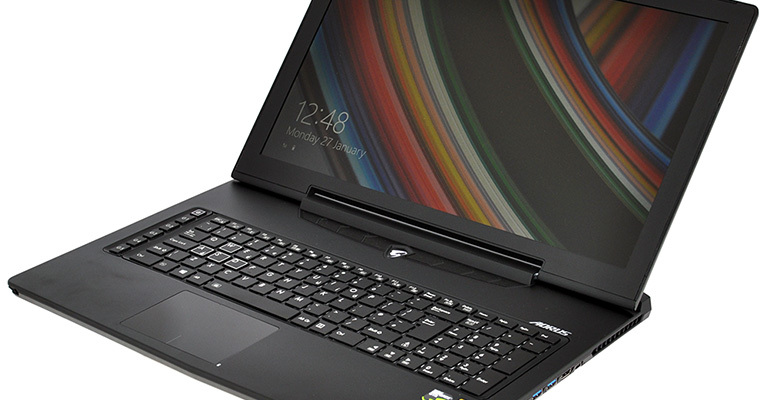 Razer has successfully shoehorned a GeForce GTX 765M in the Blade Pro, and MSI has done likewise with the GS70 Stealth. Both are commendable efforts, however Aorus is literally going one better by squeezing two GTX 765M GPUs into the X7 package. The Nvidia chips are paired together in SLI to create a combined 1,536 stream processors, 128 texture units and 32 ROPs. Each GPU has access to a 2GB frame buffer via a 128-bit interface, and going by specification alone, the numbers suggest that this dual-GPU pairing should come close to matching a single GeForce GTX 780M. That begs the question, why not circumvent the potential foibles of SLI scaling and opt for a single, more-powerful GPU? One can only assume that the thermal restrictions of a chassis this thin make it particularly difficult to squeeze in one of Nvidia's hotter and hungrier solutions. It's a shame, really, as a single, dedicated GPU is our preferred choice for most usage scenarios. One downside of Aorus's configuration that isn't immediately apparent is the SLI implementation comes at the expense of Nvidia Optimus: the limitations of the technology are such that you can't disable both discrete GPUs and revert to the Intel IGP to help save power: you have to be using at least one Nvidia chip at all times, which as we'll detail later in this review, takes a significant hit on battery life. Then again, are gamers really going to mind having to stay close to a power socket? Perhaps not, particularly when they have a specification sheet as envious as this. Alongside the SLI'd GPUs, Aorus has installed a quad-core, eight-thread Intel Core i7-4700HQ processor that's capable of hitting 3.4GHz and served it with a 16GB dose of DDR3 memory. 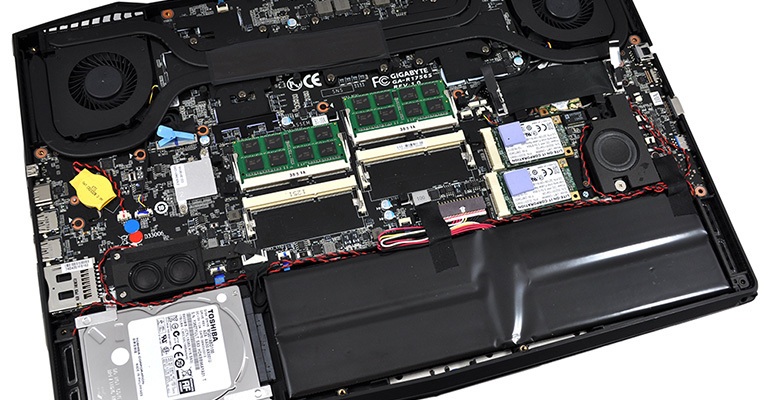 The laptop has a total of four DIMM slots, and the default 2x8GB configuration makes it easy for users to upgrade to a potential 32GB further down the line. Storage options are equally impressive as the X7 houses three drives: two LiteOn 128GB mSATA SSDs and a Toshiba 1TB 2.5in hard drive. The SSDs are configured in RAID 0 to act as a high-performance system disk, and though the accompanying Toshiba hard drive is a basic 5,400rpm model, it's a useful companion for spare storage. Aorus understandably couldn't find room for an optical drive (not that we miss it) but what space is available has been put to good use. 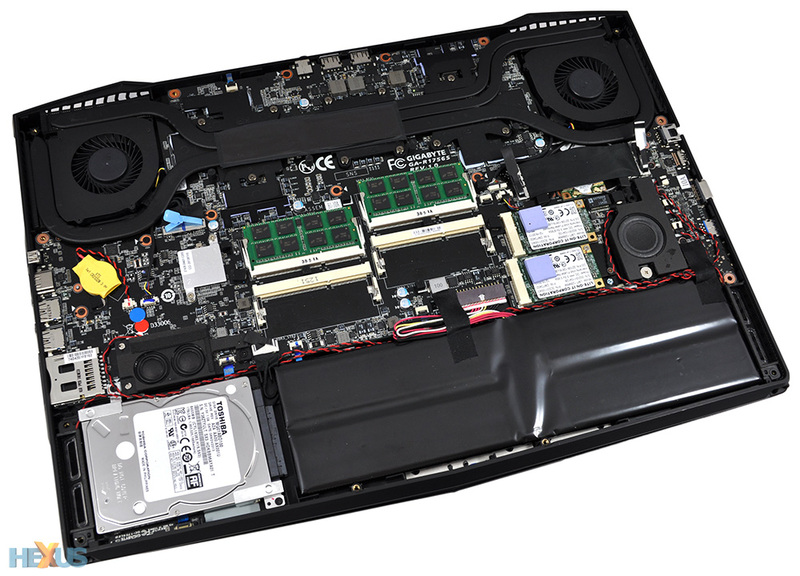 We can see a 73.26Wh Lithium Polymer battery, designed not to be removed, positioned near the front of the system, while the back is devoted almost entirely to cooling the laptop's three processors. The central Intel CPU is flanked by Nvidia GPUs and a total of five heatpipes are used to transfer heat to a pair of dual-vented fans. There's a lot to take in, and Aorus hasn't skimped in terms of I/O, either. The laptop's left edge is home to Gigabit Ethernet (powered by a Qualcomm Killer e2200 controller), HDMI and VGA outputs, a USB 3.0 port and a pair of audio jacks. On the opposite end we have an SD card reader, a further two USB 3.0 ports, as well as HDMI and mini DisplayPort. The multiple video outputs shouldn't be considered overkill as the X7 has the power to drive three external displays via Nvidia Surround technology, and though we suspect gaming will be too big a challenge with multiple screens, it's a real boon for productivity. And the I/O ports don't stop there. Catering to the needs of gamers, the connector for the bundled 180W PSU is kept out of the way around back, where it's joined by a pair of USB 2.0 ports that are ideal for hooking up peripherals. Wireless connectivity is top-notch, as well, with full WiFi AC support courtesy of a dual-band Intel AC 7260, along with integrated support for Bluetooth 4.0. Going by specification alone, this is a lot of technology on offer for £1,659. But what's the Aorux X7 actually like to use?